When it comes to the Kardashian / Jenner kids, it seems like there are so many of them nowadays. Kourtney has three: Mason, Penelope, and Reign. Kim has three as well: North, Saint, and Chicago. Kylie has little Stormi, and the newest addition to the bunch is Khloe's little bundle of joy, True. And while they each already have amazing fashion sense, one thing becomes quite evident: These cousins (and siblings) love matching their outfits to each other and sporting a good ol' partner look. It all started with North and Penelope wearing similar clothing, and ever since they did it the first time, they pretty much never stopped. But now the younger generation of girls, namely Stormi, Chicago, and True have started exploring the perks of being coordinated as well, and they are learning really fast. We decided to take a look at some of their best matching looks and see what and how they actually match. So here they are, 20 times the Kardashian/Jenner kids sported matching looks and sort of made all of us grown-ups want to do it as well (why is that not OK past the age of ten — can someone enlighten us?)! When it comes to matching outfits and partner looks, Kourtney and Scott's daughter Penelope Disick and Kim and Kanye's firstborn North West are the ultimate queens. The two have been seen rocking such amazing partner looks that leave us all in awe. Here they are sporting the partner ballerina look. 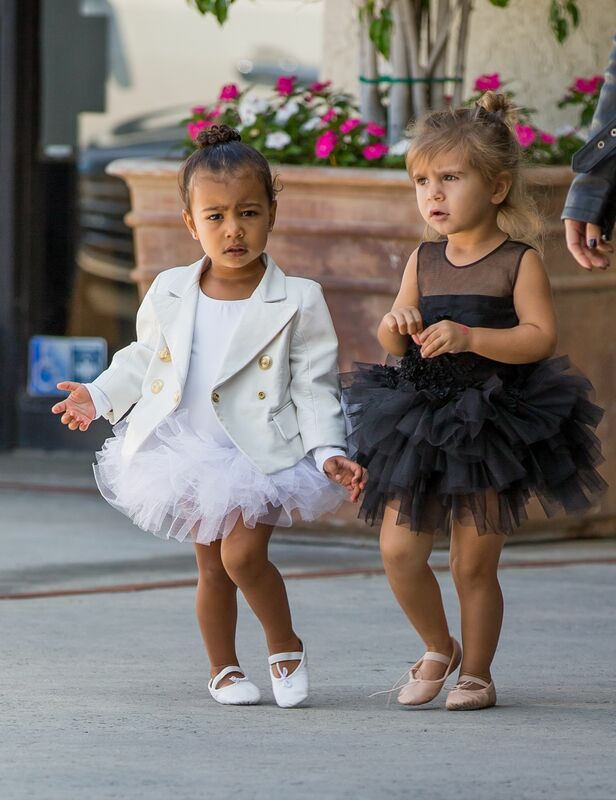 North is rocking a white tutu dress, while cousin Penelope is wearing a black one. Honestly, we can't say who wore it better, but one thing is for sure: these two are bound to grow into major fashion icons once they're a bit older. For now, they are fashion icons for kids! And yes, North and Penelope don't believe in that whole "you can wear an outfit only once" thing, and why would they? If you love a look, wear it over and over again. And these two absolutely adore their ballerina attires! Here they are, North in the white one again, and Penelope rocking a classic pink one this time. The two are close in age, Penelope is six and North is five years old, which means the two love hanging out, and they hang out almost every day. Which means we get to see plenty of coordinated looks, and two little girls who seem to have fun matching! Now let's move to another Kardashian/Jenner pair of kids. North and Penelope might be great at the partner look game, but they had plenty of practice. Kylie's daughter Stormi and Khloe's daughter True (both of which were born last year) don't have nearly as much practice, but we can already tell that they are natural talents. The two are here with Khloe rocking adorable unicorn outfits. Stormi is looking adorable with a unicorn headband, while True is rocking a slightly more extravagant version, a full on unicorn costume. Either way, these two cousins are probably the most adorable unicorns we've seen in a while! Alright, it's time to take a look at the boys! In the pic above Kourtney's son Reign and Kim's son Saint are serving us such fun looks with their adorable rap star costumes! The two were probably inspired by Saint's famous daddy Kanye, and we bet everyone loved this look the two pulled off! Just like Penelope and North, Reign and Saint are also close in age, Reign is four and Saint is three years old. It's really nice to see that the Kardashian / Jenners have such a strong family bond and that all of their children love spending time together! But now let's go back to queens Penelope and North. 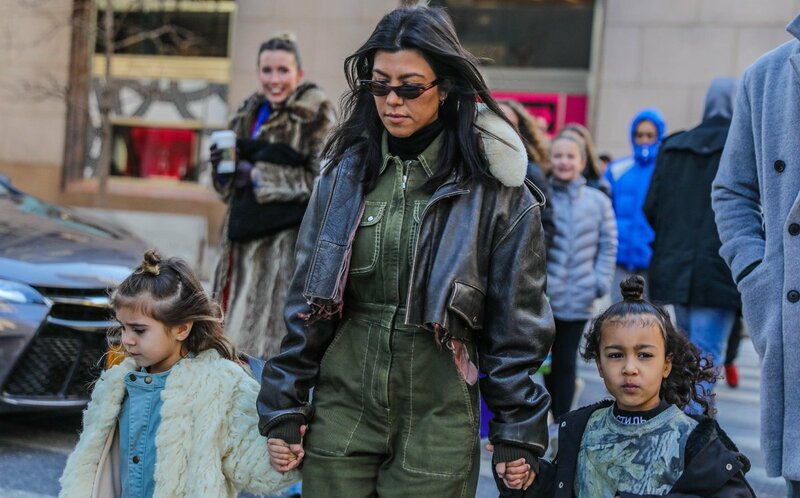 The two adorable cousins were spotted taking a walk with a very stylish Kourtney Kardashian, and let's just say they each rocked their own look, but still managed to kind of match. Penelope and North both had a half up-do with a bun, and seriously gave us some major hair envy. How come these two that don't even go to school yet are serving looks that we can only dream of serving one day. And they do it all so effortlessly! I guess with role models like Kourt, we're not even surprised! Okay, get ready for some major cuteness overload, because Stormi and Chicago are too much to handle! Kylie's and Kim's little bundles of joy wore matching pink pjs, and can we all now agree that they stole everyone's show here. The two definitely know what constitutes an appropriate Wednesday attire (virtual high five to you if you get that reference), and are perfectly coordinated. Well, with Kim and Kylie as moms, fashion is definitely in their genes, and we can't wait to see more coordinated fashion from these two! Penelope and North, you better watch out, they might just kick you off your thrones! Okay, okay, correction: Stormi, Chicago and True might kick you off your thrones! As you can see, Chicago told True about the Wednesday fashion rule, and True was so on board! And this photo is just too adorable, we could sit and admire it for ages. Khloe Kardashian's daughter True, which is the youngest of the three is already showing us her amazing looks, and we can't wait to see more of her. Honestly, we have a feeling that this trio might just take over the world one day, and we are super thrilled about that! No pressure girls, no pressure! 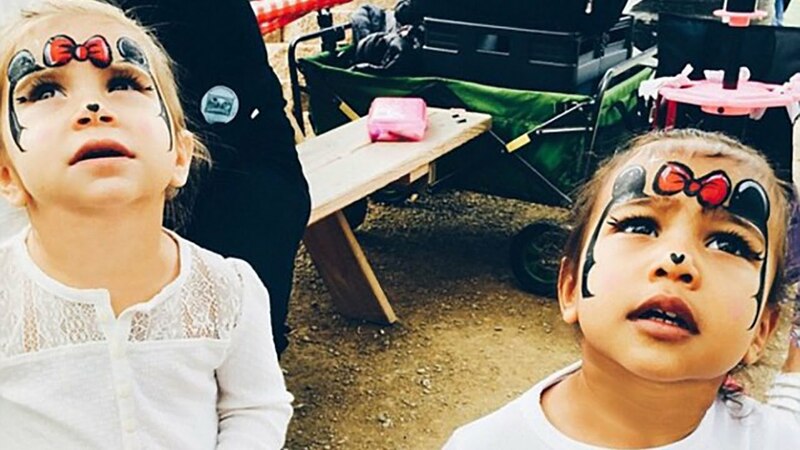 Penelope and North have explored the wonderful world of getting their faces painted, and you bet they went for a matching look! They both sported a beautiful Minnie Mouse look, and, if we may add, matching white tops. Whoever painted their faces did a marvelous job, and we bet the two loved it so much they had a hard time taking it off. Just look at their adorable little noses with the tiny black hearts on the tip! Yeah, I might be in my late 20s but I am extremely jealous and I wish someone did this on me as well! This is such a heart-warming pic of the two cousins! Just look at them, just strolling away, exchanging secrets, and holding hands, like the best friends they are. Oh, and of course, matching looks are a must, and this time they went for a more casual style. The two wore similar oversized long-sleeved shirts, sneakers and topped the whole look off with matching buns. If there's one thing that Penelope and North taught us about matching styles, it's that the easiest way to do it is by coordinating hairstyles. It takes almost no effort, and it is definitely still noticeable! Okay, this photo is absolutely stunning (but then again, which one on this list isn't?)! Mason, Penelope, Reign And North are all posing wearing black and our hearts are bursting! Kim and Kourtney must be doing something right, because these kids always look absolutely adorable, happy and like they're having a great time! Keep up the good work moms, and keep posting all these beautiful photos, because the world does care, and we need more of this kind of cuteness in our lives! Sure, many people might not be the biggest fans of the Kardashians, but no one can deny that their kids are totally cute! Just look at those pinch-able cheeks! True and Chicago are both wearing similar looks here, that they decided to top off with adorable hats. We honestly can't decide which version we like more, True's innocent ivory white look, or Chicago's cool gray attire. Both clearly have their own style they went for, yet they also managed to slightly match their looks, and prove they are true baby fashion icons. Nope, we refuse to believe that moms Khloe and Kim actually dressed them, we are staying by our statement that it must have been True and Chicago's own fabulous fashion choices! Here's a paparazzi pic of little Penelope and North with their grandma Kris, strolling around Los Angeles looking fab as usual. While grandma Kris opted for a classy all gray look (we totally approve), her granddaughters Penelope and North decided to match once again, as they both went for simple white clothes this time. While Penelope showed us her more casual and comfy side in this adorable sweatpants and top combo, little North decided to dress it up a bit, by wearing a silky t-shirt dress with some Converse sneakers. As always, both looked absolutely gorgeous, and definitely stole grandmas spotlight - which we bet she didn't mind! Now how about this photo of Kris and her mom Mary Jo with Chicago and True? Isn't it absolutely stunning? And yes, Mary Jo is their great-grandmother, which makes this pic even more amazing. It seems as if the whole family sort of coordinated their looks with light, cool tones, but Chicago and True were definitely on the same page. They both wore cute tiffany blue looks, and while Chicago went with a fluffy tutu, True decided to pull out that unicorn headband, because why not? Fashion should be fun, and these two girls know it, and love by it! 7 How Stinkin' Cute Are Little Penelope And North? Of course Penelope and North are also always coordinating their Halloween looks, and why wouldn't they, it just makes the whole thing that much more fun! So here they are, both of them looking stinkin' cute (see what I did there?) in their little skunk costumes, probably the cutest ones we've ever seen! While North stuck to just the costume itself, Penelope decided to up things a bit with some makeup as well. With our without the additional whiskers, both look absolutely adorbz. We can't wait to see what other costumes these two have up their sleeves, Halloween can't come soon enough! Penelope and North are known for wearing costumes to birthday parties, baby showers, pretty much any occasion you give them, these two will show up looking spectacular. here they are rocking princess looks, they couldn't be any cuter! One thing is evident on this list, these two have perfected the art of matching looks, and they had quite a few years of practice at it! All the other kids have tried doing it, but so far nobody had been able to take these two off their throne, even though Chicago, True and Stormi seem to be getting pretty darn good at it! Remember when we said how Penelope and North taught us that the easiest way to coordinate and do a partner look is to do similar hairstyles? Yup, little Stormi and Chicago clearly carefully took notes, because here they are rocking adorable little buns! While Chicago went for two symmetrical ones, Stormi decided to do just one on the top of her head with a lovely little pink bow. They are definitely learning things quickly, as you can tell by the fact that they also have perfectly matching baby walkers! We bet True also has the exact same one as well! Here's a pair of actual siblings wearing a matching look! Kourtney's kids Reign and Penelope were spotted with her rocking a relaxed airport look, with matching tracksuits. While Kourt is giving us total cool mom vibes with her look, Reign and Penelope are perfectly matching in Adidas tracksuits. While Penelope's is a vibrant red one, Reign chose a more muted navy color. The whole family looks ultra cool, and they are definitely giving us those "you don't wanna mess with us" vibes. Guess Kourtney taught her kids a couple of things about serving looks, and Penelope and Reign have definitely been good students. We already know Penelope and North slay the matching game, but here's proof they can also be full-blown divas at it! The two were seen with Kourtney wearing stunning faux fur coats in black, each slightly different, but both equally gorgeous. Penelope's is a bit longer and less fluffy, and she decided to pair it with some mom jeans and white tee, making the whole look slightly less glam, and a bit more everyday appropriate. Meanwhile North decided that toning things down isn't really her cup of tea, so she paired her shorter and fluffier coat with a Breakfast At Tiffany's inspired dress. Needless to say both looked amazing! Saint and mommy Kim are also no strangers to extravagant jackets and coats. While North rocked the same fluffy black one again, little Saint went for a more bomber jacket style, with a furry hood! But let's be real here for a second, we all know they learnt everything from their mom Kim, who has been inspiring with her fashion ever since she got famous. Now we know this list is about the kids, but how stunning is Kim's bold look with the black over-the-knee boots and floor-length coat? Even little North seems to be a bit annoyed about Kim stealing her spotlight, doesn't she? But do not worry, Northie, no one is as iconic as you and your cousin P, and the incredible looks you've given us. 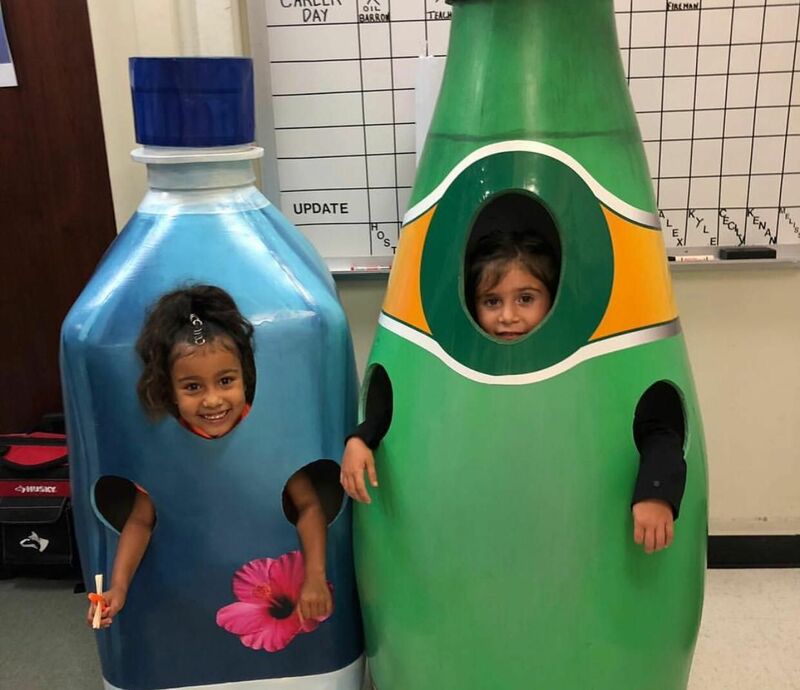 To wrap things up, here they are as bottles, or condiments or well, we're not sure exactly what, but they are matching for sure, and that's what it's all about. The Kardashian/Jenner kids have shown us all how adorable partner looks can be, and we genuinely can't wait to see more of what they will give us. These kids make fashion fun, and at the end of the day, that's what it should all be about.